The provinces and dioceses of the Roman Empire, on the eve of its final division. As centralized power declined, the vast empire had grown unwieldy and almost impossible to control. Review by Emperor on 5/5/2012. I've tested this map on single-player and sadly I have to say it's not a good one. Only very few bonuses are small like Diocese of Dacia and give possibility to gain first bonus fast. Others like Diocese of Gaul or Diocese of East are huge and are almost impossible to take. There is small amout of territories and huge bonuses (like Prefecture of East) which are unbalanced for map of this size. IMO it needs further improvements. It's a good map. It has extra bonuses based on the side of the Roman empire like if it's after the The empire got split up which acording to the date it would be. Review by  Sabian49 on 6/3/2012. Review by jwtp21 on 5/4/2013. Great accuracy with history and very a very strategic map. Review by Spanish class on 4/23/2012. 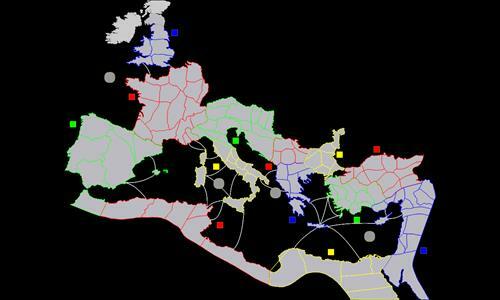 Good job of the incorporation of all the territories in Rome at that time, we still need a Rome. Good job man. Review by Le Count H on 9/14/2014. Nice map of the Roman world. Germanica II and Germanica one should not connect to each other. Review by cor696 on 10/13/2012.